It was announced on Friday, February 19 that seven new firefighters were recently hired by the City of Poughkeepsie, NY. 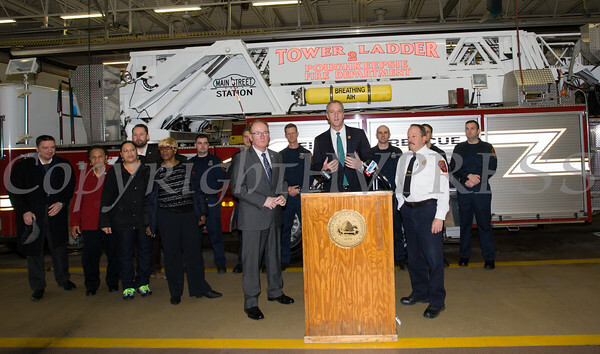 US Rep Sean Patrick Maloney (NY-18) was joined by City of Poughkeepsie Council members, Mayor Rob Rolison and Fire Chief Mark Johnson to announce on Friday that seven new firefighters were recently hired by the City of Poughkeepsie, NY thanks to a SAFER grant Maloney helped to secure. Hudson Valley Press/CHUCK STEWART, JR.